Here again is some video from 2004. 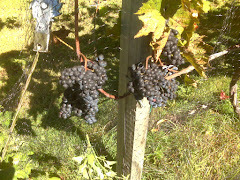 It is footage of my vineyard in mid September as the grapes began approaching ripeness. My vineyard has changed a lot since then as I've detailed in my posts. I have removed varieties and replanted with others. I've also learned a great deal since then and it's reflected in how I mange my vines now and how I did back then. My video skills need some work and I think a better camera is in order, but you'll at least get a feel for the layout of my vines. I will film an updated "vineyard tour" this summer and post that as well for comparison. I hope you enjoy this little walk through my vineyard. 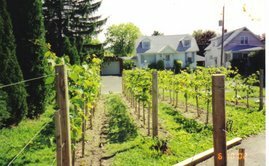 The varieties you'll see growing are Cabernet Franc, Marechal Foch, Frontenac and Riesling. And thank you for sharing the videos of your 'backyard' with us. Very neat, indeed! Thanks so much for "Taking a walk" through my backyard vineyard. Hope you enoyed it as much as I do!